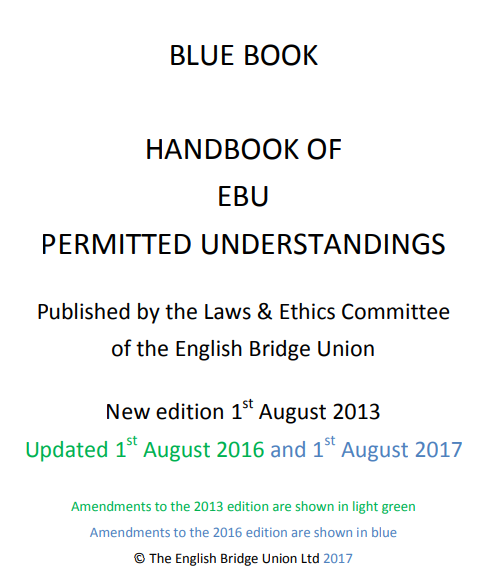 The amendments made in the 2017 edition of the Blue Book needs to be accepted (presumably the Word version of the document is held at EBU) and produce the book in final form. This way 2017 Book looks tidy and easy to read . Could someone at EBU look into this ? I'm not sure what it is you are asking. It is in it's final form. It'll soon be looked at with a view to updating it for 2018, as happens annually. I mean amendments made are in blue In a black typeface. There is a functionality in Word document to accept the changes made so the document is in same colour and font etc. It's deliberate, so readers can tell which were recent changes. It might be a good idea to include the EBU's rationale for defining a 'strong hand' since that has been the most contentious issue. It's likely to be discussed at the next L&E meeting. The rationale for defining a "strong hand" is that we do not want, say "2C = 0-9 any shape" to be called "strong" and being permitted. The rationale for a particular definition of "strong" may or may be not be clear from the L&E meeting discussion. The question is: where do you draw the line. But the point is not the definition it is publicising the reason why the definition has been decided. There are negative inferences (You must make clear that the HCP may be limited), but nothing like: "The L&EC are concerned that use of the word 'strong' may be applied to hands that are capable of winning many tricks in only one or two denominations and thus dissuade competition from players holding the other(s)." There are two uses of "strong" that the regulations and players need to get right. Disclosure: We don't want hands described as "strong" to the opponents, when the opponents could well be making game based on high card strength. Permitted Agreements: Here the label "strong" has become debased but we need to distinguish a strength of hand which can be opened as 2C+ without further restriction on the shape/suits shown. Frances Hinden's article at http://www.ebu.co.uk/documents/laws-and-ethics/articles/BlueBook-section-7C.pdf does a good job of not only explaining what the rule is, but addressing some of the reasons for it. complaints that the current rules are too lax. about the meaning of double or a “cue bid”. That article is a classic politician's response. It doesn't work well but it's the best we can do. They don't want a strong opening to be misunderstood.. I've given up trying to make sense of it. Please feel free to proffer your own suggestions as to the best way forward. The EBU having this philosophy, how best do they implement it? Rather than using playing tricks in definitions wouldn't it be better to use number of losers. At least the latter is well defined (by Klinger et al). The Blue Book does not use "playing tricks" in any definitions. I would not recommend using "playing tricks" in disclosure to opponents: nobody agrees (particularly within partnerships) what they mean. I don't see how I can disclose my Benji 2 opener other than as "8 playing tricks, unspecified suit", since that is our agreement. * when your agreement is "8 playing tricks" do you have an implicit understanding that the hands you open constitute a permitted agreement. Robin, I'm just trying to understand the EBU thought processes because they baffle me. When I first started dabbling in EBU club bridge, traditional Acol was effectively obsolete. That was 1993, a quarter of a century ago. So, yes, playing locally where Benji (usually reverse) is the norm, absolutely everybody knows it could be be intermediate strength with no outside defence - in fact that's what they expect. Nobody has a problem with it. It's only the second strongest bid anyway. Certainly nobody harks back to ancient history; most don't even go that far back. As for the implicit understanding, well, all I can say is that I don't open 2 or 2 on hands that don't qualify under the Blue Book. However one of my partners is a novice (this is meant as a teaching partnership) and the other a social player (this was a non-EBU club that merged with my EBU club on the owner's retirement last October), and neither understands the rules. So, I can't honestly say we have the implicit understanding we should have. (If I had a tournament standard partnership, we would, of course.) However neither will 80% of the room, and I do feel cheated if I get a non-compliant 8PT hand, because I know there's a risk we'll miss a game or slam that will be bid on other tables where the opposition will not know there's a problem. The EBU thought processes centre on complaints that opponents had opened 2C - it was explained as "strong" or words that made the hand sound strong - and yet the complainant's side should be bidding constructively and reaching game. The regulations sought to support these complainants by restricting the "good" preempts that were allowed in a 2C opener and by "suggesting" that bids that are often intermediate are not described as "strong" (or words that sound strong). Is there a demographic to these complainants? Because, where I play, it's not a problem and wasn't a problem 25 years ago. Nor have I ever seen it a problem in tournament bridge. The problem is essentially one of disclosure, and I don't know of any other methods that the EBU have chosen to restrict so significantly rather than just address the issue of making sure that disclosure is correct, especially where, in this case, the methods being restricted are completely normal. As an aside, I'm completely unaware of anyone thinking in terms of a distinction between "strong" and "intermediate" hands. It's very difficult to get full disclosure if what is required is a concept that the responder is completely unaware of. StevenG: are you saying that in the mindset prevalent where you play, the players (possibly subconsciously) equate a 2 opening with a hand which has a decent chance of making 8 tricks playing in its long suit, assuming that partner contributes nothing useful, outside high cards being possible contributors to the trick count but hardly essential; whereas a 2 opening promises lots of lovely high cards (or vice versa if Reverse Benjy is the fashion)? If everyone is happy with that and it doesn't cause problems, then I suggest your club(s) publish a systems policy which permits this, and cease to worry about what the Blue Book says on the subject. (b) the general run of tournament players don't see the need to waste a strong-sounding bid to use on a pre-emptive hand. The fact of the matter is that the rules have changed for Benjy bidders in that they cannot open 2 Clubs preemptively in club suit , described as Strong, if the hand does not have the necessary HCP and/or controls criteria set out in the amended version of the 2017 BB . The reason being that it provides opponents an opportunity to Bid their hands with lovely HCP points or to defend to their advantage by doubling etc. I feel that someone with authority should write an article in EBU magazine so as to provide a clear-cut guidance to Benjy community and alike. This is a huge change in rules and as such it should be well explained in as many publications as possible. Abbeybear: yes, that's essentially what I'm saying, although of course the strongest bid may, extremely rarely, also be a 10 trick hand. (And I'm ignoring the balanced hands.) The better players know the difference between a hand on which they should preempt and those on which they should bid constructively, but the weaker players don't and I certainly don't want to stop their enjoyment of playing that type of hand. (I'll make a profit anyway if they are playing bad bridge.) Anyway, there are plenty of Benji 2 hands come up that ARE are a natural Benji bid but and not a preempt but still non-compliant with the new regulations, much more so than under ER25. Well, with my partners I play 3 weak 2s and 2C is our only forcing opening bid with a wide range of possible meanings (clarified after a 2D relay). We announce this bid as 'Our only strong bid, but it may not be as strong as you might imagine' (with some slight variations on that theme). In my experience, good players generally don't care as they essentially play this sort of bid in a similar way (though maybe not quite as wide-meaning as us). Bad/inexperienced players sometimes ask for clarification, so they are told that it could be 23+ any distribution, or it could be based on length of the supposed trump suit and a few points (circa 16+). Hopefully this meets with the requirements? Again - it is only if the intention is to open showing clubs as a possibility. In which case the hand must actually be 'as strong as you might imagine'. 16+ HC points is by definition strong - you just can't have an agreement to drop below that figure, with clubs, unless holding 5 controls. You would only announce 2C as "intermediate to strong" if it was always natural and had (10+ points)* (and in fact the announcement is not correct as you have to add "forcing' or 'not forcing' to the description, I think). Isn't only if it is to be described as strong (or similar) that it would have to be meet those requirements? Can 2C not be a weak 2 in clubs, if one so desires and announces as such? Anyway, there are plenty of Benji 2 hands come up that ARE are a natural Benji bid but and not a preempt but still non-compliant with the new regulations, much more so than under ER25. If you believe that, then your understanding of what constitutes "a natural Benji bid" seems to be rather different from mine, I'm afraid. Yes, although your use of the word "announce" is slightly worrying. I assume that you mean that you alert and use this form of words when answering any questions, rather than announcing in the way the Blue Book requires for natural 2-level openings. Even if you thereby provide helpful information (and I definitely think your form of words is helpful) it is clearly incorrect to announce (in the BB sense) when partner has made a bid that is not natural. 2C Precision - announce intermediate. Well, my 2C is not strong in the new sense (though normally it will be, but regularly not) and it is not precision. So I alert. Doesn't this essentially force people to ask, what is this bid? If described as potentially a semi-preemtive hand then they overcall. If described as a power hand, 23+ points, then they pass. Isnt this passing UI to their partner? It has always been the case (since the launch of announcements) that 2-level suit openings were either alerted or announced. Artificial openings are alerted; natural openings (excluding Lucas, etc) announced. Nothing has changed. wasn't 2C announced as strong forcing, strong game force etc...? etc?